TUESDAY, Sept. 16 (Health.com) — The first large-scale human study of bisphenol A (BPA), a controversial chemical found in hard plastic bottles—including baby bottles—and in the lining of food cans, suggests that long-term exposure may raise the risk of type 2 diabetes, heart disease, and liver problems. The authors of the study, published Tuesday in the Journal of the American Medical Association, are presenting the data this week to a Food and Drug Administration (FDA) scientific committee, which is examining the overall safety of the chemical. BPA is thought to be harmful because it acts as an endocrine disrupter, a compound that has hormone-like effects in the body. In the new study, David Melzer, MD, PhD, of the Peninsula Medical School in Exeter, U.K., and colleagues analyzed data from 1,455 U.S. adults aged 18–74 who participated in the Centers for Disease Control and Prevention’s 2003-2004 health survey. When they looked at the amount of BPA in urine samples, they found that people in the highest 25% of exposure were twice as likely to have heart disease or type 2 diabetes as those in the lowest 25% of exposure. Elevated BPA in urine was also associated with abnormal concentrations of liver enzymes. People with the highest urinary BPA were probably exposed to 50 micrograms of the chemical per day while those in the lowest group had 10 micrograms of exposure per day, the authors estimate. They say these levels are much lower than those currently considered safe, or about 3,250 micrograms per day for an adult who weighs 143 pounds. Where does BPA come from? You can be exposed to the chemical in food; small amounts can leach out of the linings of canned food or food and beverages stored or heated in hard plastic containers (but not softer, more flexible plastics, such as those found in soda and water bottles). About 2 million metric tons of BPA were produced in 2003, making it one of the world's highest production-volume chemicals, according to the report. 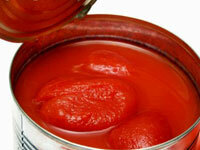 Acidic food, such as tomatoes, can cause even more BPA to leach into food, he says. But you can also absorb it through the skin and get trace amounts from drinking water, dental sealants, and household dust. About 90% of people in the United States have detectable levels of BPA in their body, according to the report. However, the study can’t prove conclusively that BPA is the cause of the heart disease or diabetes in humans. “We do feel our study needs scientific follow-up,” says Dr. Melzer. The American Chemistry Council issued a statement that said "the onset and development of these diseases occurred over time periods well before the bisphenol A exposure measurements were made. Because of this and other inherent limitations, the study is not capable of establishing a cause and effect relationship between bisphenol A and these health effects." However, the study findings do correlate with research conducted in cells, rats, mice, and monkeys, according to vom Saal, Curator’s Professor of Biology at the University of Missouri-Columbia. Earlier this year, many retailers said they would remove BPA-containing baby bottles from store shelves. The Canadian government is currently considering a ban on polycarbonate baby bottles that contain bisphenol A. If you want to avoid exposure to BPA, check out these recommendations from Health Canada. If want to avoid polycarbonate, which contains BPA, look for a triangle-shaped recycling symbol with the number 7 in it and sometimes the letters PC. This indicates it’s polycarbonate. Not all items with the 7 symbol contain BPA, and if the bottle doesn’t have a recycling symbol, it may still be polycarbonate.